Some of you probably saw the title of this post and thought that I was going to write something about basketball. While basketball is extremely popular in my household and I’m sure we’ll be watching our fair share of the March Madness college basketball tournament, the title is actually referring to how insanely busy March is already shaping up to be. And by the way… how is it March already? I feel like it was just Christmas! 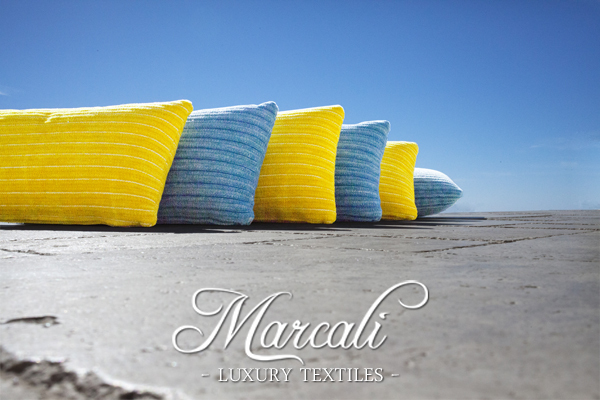 The above photo is from a recent photo shoot we did with some fabrics from our line of Marcali luxury textiles. The blue and yellow fabric on the pillows is actually from our outdoor fabric line and it is seriously the coolest fabric ever and I’m trying to convince David that I need some of it at our house. So far he isn’t biting, but I’m persistent. I’ve been in heavy photo editing mode in the design studio working on new website graphic and promotional items which is a bit tedious but exciting at the same time. We also have some big hospitality projects in the pipeline that have us looking into purchasing some new equipment for the workshop. All exciting stuff, but as I get measurements for the new equipment that David wants, I’m scrambling to figure out where exactly we are going to put everything. Oh, and I have a new interior design project on the horizon. I’m sure I’ll be able to share more of that project as the installs get closer, but we are still in the preliminary planning phases, so it will probably be a while. Yikes! I still have to work out how I’m going to figure in time to sleep. It’s all fun though and I’d rather be busy than not have anything to do.